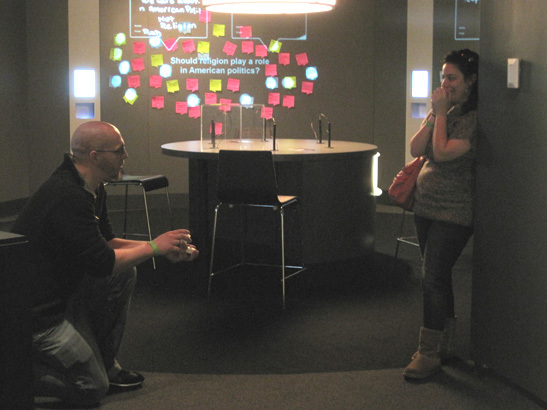 I stood there pretending to be a Museum visitor studying a timeline of American Jewish history from 1945 to the present but was quick to pull out my camera and shoot the first marriage proposal to take place in the Museum since it opened its doors a year ago. So it’s a little dark. What do you want from me? I was trying not to interrupt. We also put the ring in an exhibition case complete with an artifact label displaying a short speech Josh had written about their time together. We were all too happy to oblige this groom-to-be’s special request. Cheryl had been to the Museum before and was explaining to Josh how the interactive feature works until she stopped on that final question, commenting how it would be a perfect one for them to answer. Then, thinking the ring was yet another artifact on display at the Museum she admired it (clearly missing the label) and continued walking when Josh took the top of the case off and I heard, “Oh my God.” This is when I snapped the picture. Staff came out of the woodwork to offer congratulations and Museum Director Ivy Barsky presented the couple with a gift basket from the Museum Store, a Dual membership, and a “Shardz Wedding Vessel,” (a glass) used for breaking during the wedding ceremony on sale in our Museum Store judaicashop.net. So mazel tov Josh and Cheryl! Thank you for sharing this simcha with us. We hope the memory of that moment will be shared with your children and grandchildren and that they too, make the Museum a part of their lives. On this Veterans Day, it is fitting that we remember Leon Paul and all of the brave soldiers who have sacrificed so much in order to preserve our freedoms. Our Museum celebrates those freedoms and all they have meant to Jews who came to these shores to escape oppression and poverty. My father, a Holocaust survivor lucky enough to find his way here after the war, was one of those American Jews, and because America welcomed him so warmly I (along with others of my generation) had the great good fortune of growing up with freedom and prosperity unprecedented in all of Jewish history. We all owe an enormous debt of gratitude to Leon Paul and his fellow soldiers, past and present. 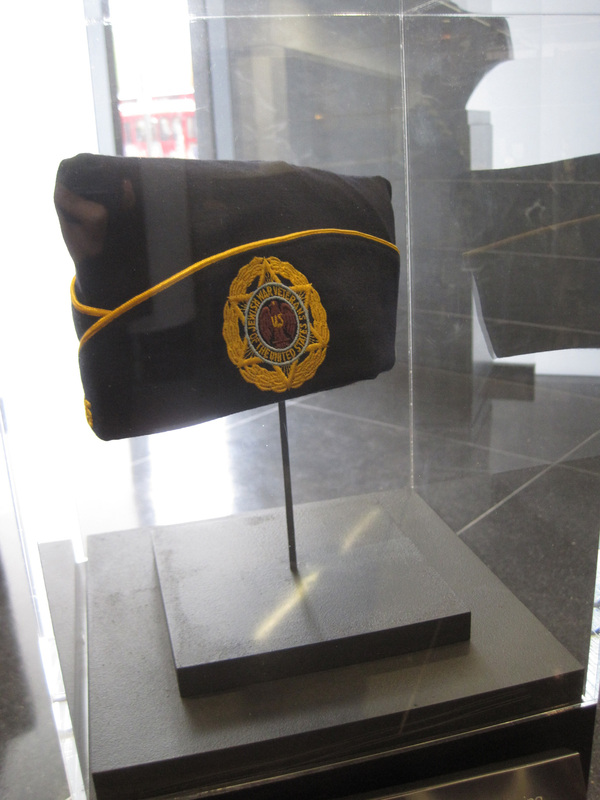 On this Veterans Day, it is my distinct privilege to thank them for their sacrifice and the Museum is proud to display the cap in recognition of their great service. 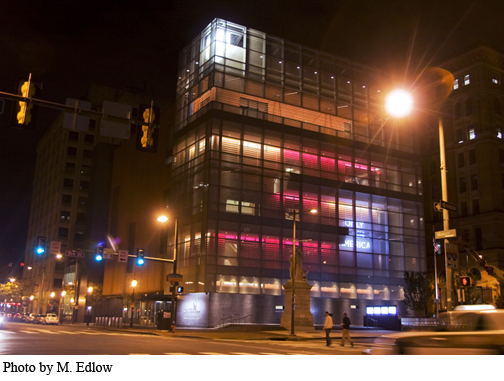 If you were on Independence Mall this past month, you might have noticed a pretty pink glow on the Museum’s west-facing glass façade. My seven-year old daughter and I were on the top of a double-decker bus last week for a nighttime tour of Philadelphia. I was very proud to explain to her why our building was dressed in pink. The Museum changed the lighting in order to participate in a campaign by KYW-TV during National Breast Cancer Awareness Month, in which Philadelphia’s skyline was turned pink for the tenth year in a row. This was the Museum’s first year in our new building and we were delighted to participate. While our mission is to preserve, interpret, and celebrate the 350-year history of Jews in America, and to explore the blessings and challenges of freedom, it is also about community and family. We are proud of our role in the community and pleased to support important initiatives like Lights for the Cure. It is probably not unrelated that the Museum family (staff and supporters) includes a substantial number of breast cancer survivors, and we have all lost family or loved ones to this disease. We hope that, in our small way, we were able to increase awareness of the effort to encourage women to get screened for breast cancer. I know I wasn’t the only mom of a daughter to point toward the Philadelphia skyline this October.